CALORIC has won an international tender to supply engineering, procurement and construction of a syngas cleaning pilot and demonstration plant installed downstream of a gasifier as a general contractor. The syngas cleaning plant with a capacity of approx. 200 Nm3/h raw gas is a complementary unit to the already existing High Temperature Winkler (HTW) gasifier with a thermal output of approx. 0,5 MWth. The syngas cleaning plant includes several gas filtration and gas washing units for the removal of impurities like benzene, CO2 and H2S followed by syngas compression up to 40 bar. Furthermore, the CALORIC scope of supply includes the construction of an industrial building as well as the integration of the turnkey plant into the existing infrastructure. With an installation area of approx. 140 m2, the pilot and demonstration plant is expected to deliver valuable insight and key process data for a better understanding of sustainable gasification of conventional and renewable energy resources. The downstream cleaning process and various catalysts will be tested for the synthesis of different basic chemicals. This plant will be operated by the Institute for Energy Systems and Technology of the Technical University of Darmstadt (EST) led by Prof. Dr.- Ing. Bernd Epple. The plant is based on process specifications of ThyssenKrupp Industrial Solutions compiled during pre-engineering. Another partner for this particular project is RWE AG who is focusing on demonstrating the chemical and energetic utilization of syngas. 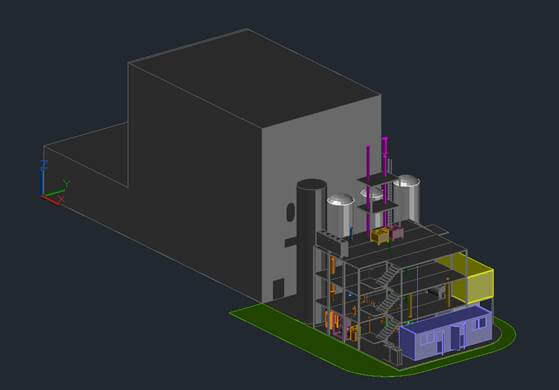 One of the project’s goals is the development of a plant design for flexible production of base chemicals such as Fischer-Tropsch fuels, synthetic natural gas and methanol. The “FABIENE” project is part of the COORETEC initiative and financially supported by the German Federal Ministry of Economics and Energy (BMWi).